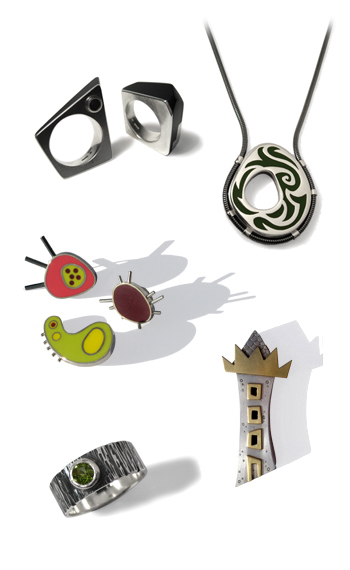 I am a designer and maker of contemporary jewellery and kilt pins based in Dundee, Scotland. Things that inspire me are natural forms and landscapes, surrealist and abstract art, nonsense stories and symbolic art, they lead me to create fun, colourful and intriguing wearable objects. I aim to create timeless but unusual designs, unique pieces that will last a lifetime, not just a season, with quality materials and good craftsmanship. I enjoy working with my customers to create bespoke pieces of jewellery and think it's important jewellery should have a personal meaning and story behind it. I specialise in handmade bespoke kilt pins, designed to have a traditional feel with a distinctive contemporary edge and regularly undertake private commissions. Please explore the website using the links above for images of my work and online shop. To see behind the scenes, the inspiration, the making, and the occasional food/cat picture please visit my blog or social media profiles below. Thanks for visiting, enjoy the jewellery!